Novak Djokovic was very good at winning tiebreakers. 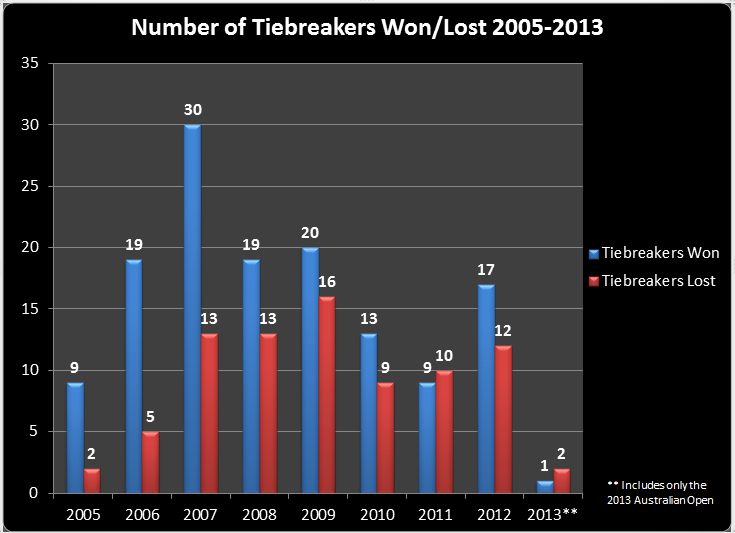 What makes you a great tiebreak player? There’s not a specific skill that translates directly into tiebreaker wins. Of course, we’ve all heard that in breakers, big serves have an edge. But Djokovic has never been anything close to a big server (even though his serve earned him a whole lot more easy points before 2009 than it does now – but that’s another story). And you have the case of Nicolás Almagro, who in 2012 ranked 5th in total aces, yet had a mediocre 19-24 record in breakers. I’ve always thought that the key to winning a tiebreaker was to avoid making mistakes. Simple, huh? Sometimes, just one unforced error is enough for a player to concede the breaker. Yet we’ve also seen many tiebreakers so full of errors that it’s only the last one that ends up costing someone the set. Still, it’s usually the player who manages to play an error-free breaker, with the right balance of aggression, margin for error, and good serving, who tends to come out on top. Novak Djokovic did all of those things back in 2006. His mental focus at such a young age was astounding. When I followed his matches in 2006 and 2007, I just knew the future World Number 1 was going to win a tiebreaker if he was ever forced into one. It didn’t even matter much if Djokovic was playing well or not – it just seemed that in the breaker, he would manage to be the mentally stronger player, and come up with the necessary shots to take the set. Fast-forward to 2013. More specifically, to the fourth round epic between Djokovic and Stan Wawrinka at the recent Australian Open. As the men headed into a fourth set tiebreaker, with Djokovic up 2 sets to 1, I just knew the match was destined to go into a fifth set. There was no way Djokovic was winning the tiebreaker – I was sure he was going to lose it. Sure enough, Wawrinka took the breaker, and we ended up in a 12-10 fifth set. Then in the final against Andy Murray, the surprise came not when Djokovic lost the first set in a tiebreaker…but when he won the second set by playing a very good breaker. When Djokovic held serve at 5-6 in the second set, I was sure that the eventual champion would have to come back from two sets to love to try and win this match, just like at the US Open last year (as we all know, he failed in that attempt). Turns out, Djokovic played a very clean breaker, and it was Andy Murray who came undone. It came as a shocker to me. – The success rate for the first three seasons listed on the graph is insane, particularly the numbers for 2005 and 2006. Of course, Djokovic was only 18 years old in 2005, and he only played 22 matches on tour that year. 2006 was his first full season in the ATP, and 2007 was the year he joined the elite, winning two Masters 1000 trophies (Miami and Canada), as well as being the runner-up at the US Open. – It’s amazing that Djokovic went from 3 seasons of absolute excellence to 5 seasons that range from “decent” to “mediocre.” What’s noteworthy is that Djokovic has yet to have a season that finishes with a success rate in the 60s. He’s come close three times, reaching 59% in 2008, 2010 and last year. 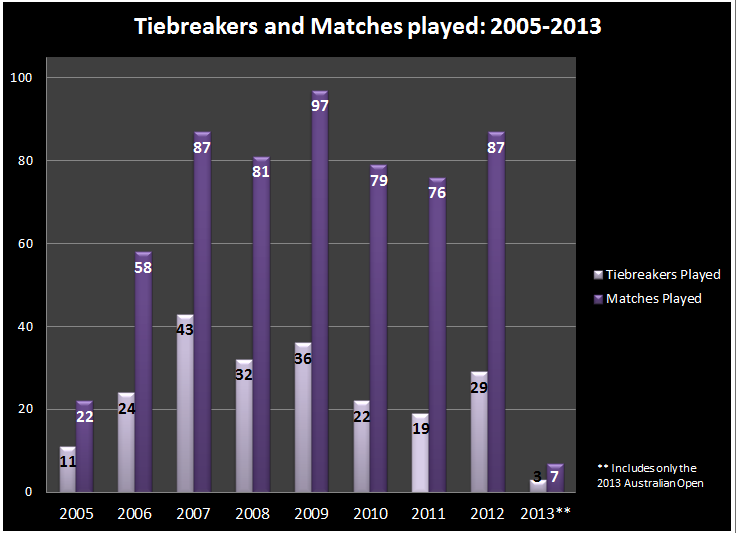 It’s interesting to see that the relation between tiebreakers and matches played trended downward from 2007 until 2011. During his breakout season 6 years ago, Djokovic was playing almost a tiebreaker for every two matches he played. But in 2011 the ratio was all the way down to one tiebreaker for every four matches. Every year during that time period the ratio kept telling us one thing: Novak Djokovic was playing fewer and fewer tiebreakers per match played. Why did this happen? Starting in 2007 and culminating in 2011, Djokovic went from being a very good returner, to being one of the three best returners on the planet (the other two being Andy Murray and David Ferrer). Hence, Djokovic was being dragged into fewer tiebreakers for the simple reason that he was creating and taking more and more chances to break serve beforehand. I don’t think the improvement was necessarily due to a change in technique (though the body serve return has vastly improved since 2009) – I think Djokovic managed to be a more focused and consistent returner than ever before in 2011, whereas in the past he would take entire sets off in terms of returning. Starting in 2008, Djokovic began the slow process of becoming stronger physically, since the rap on him early on was that he couldn’t outlast anybody. As Djokovic’s confidence in his body grew, he probably began to think that non-match deciding tiebreakers weren’t life or death anymore. I make the important distinction between middle of the match tiebreakers and deciding set tiebreakers because Djokovic does take deciding sets quite seriously. In fact, he has the 2nd highest winning percentage in deciding sets in history, only behind Bjorn Borg. In deciding set tiebreakers, Djokovic has won 10 and lost 6 – but only 3 of those six losses have happened since 2009 (Madrid and Shanghai that year, and Indian Wells in 2012). The other three took place between 2005 and early 2007. What’s fascinating is that Djokovic won his first deciding-set tiebreaker just in 2006 at ‘s-Hertogenbosch, From that point onward, Djokovic is 10-1 in deciding-set breakers, which is just nuts (the only loss came in the 1st round of Marseille in 2007, to none other than Mikhail Youzhny). Still, the point remains: as Djokovic grew stronger, he had the confidence within him that losing a tiebreak set wasn’t the end of the world – he was ready to stay in the fight for longer if needed. This is my wife’s theory, which is related to Theory Number 1: the first element is that Djokovic became a great returner of serve, starting in 2007. The second element is Djokovic’s bad habit of getting frustrated with himself if something isn’t working according to plan. What if Djokovic has been letting himself get rattled when he ends up in a tiebreaker, for the simple reason that in his mind he should have broken serve before that? In that mindset, getting to a tiebreaker is a failure of sorts, since Djokovic could feel that as one of the best returners on the planet, he shouldn’t have to resort to a breaker to win the set. At the beginning of 2009, Novak Djokovic switched racquets, going from Wilson (which he had used for the past 4 years) to Head. Soon enough his forehand started letting him down, as well as his serve. As we know, Djokovic served more double-faults than aces in 2010. Perhaps the lack of confidence in these key weapons hindered Djokovic’s prowess in tiebreakers? Still, this doesn’t explain why the 4 time Australian Open champion went from a 70% success rate in 2007 to a 59% success rate in 2008, when he still had his Wilson racquet and wasn’t showing any issues with his serve or forehand. This is a simple theory: Novak Djokovic finished the 2005 season ranked at number 78 in the world. He then finished 2006 ranked number 16 in the world. The next year Djokovic would find himself in that #3 ranking that he would occupy until his monster 2011 season. The point is simple: as Djokovic climbed up the rankings, more and more people took notice of him, and the Serb started playing better opponents in the latter stages of tournaments. More pressure, bigger matches, and a tricky group of opponents that could help derail any type of tiebreak mojo. You can easily see a simple fact: Djokovic doesn’t have a winning record in tiebreakers against anybody in the Big 4. His record against Nadal is particularly abysmal. It’s actually surprising that Djokovic fares the best against Federer, who is apparently the greatest tiebreaker player in history, as I mentioned above. Still, if it weren’t for the pair’s eventful first set tiebreaker at the final of the World Tour Finals last year, Djokovic would also have a losing record in tiebreakers against the Swiss. In sheer numbers, Djokovic only played 5 tiebreakers against the Big 4 prior to 2008 (all against Federer, who won 3 of them). Interestingly enough, Djokovic has played all his tiebreakers against Murray and Nadal starting in 2008, and he’s a combined 6 and 14 against them. Can it be that losing so many tiebreakers to his biggest competitors dented Djokovic’s own confidence in them? We know how much of an impact the Madrid 2009 loss to Nadal (in which he lost the last two sets in tiebreakers) had on Djokovic’s game in general. Not everything makes sense about an athlete’s career. For example, Djokovic’s reputation as the Houdini of Tennis can’t really be explained logically. I thought that by looking at Djokovic’s history with tiebreakers I could get a glimpse into what made me expect a tiebreaker win back in 2007 and now has me expecting certain defeat in 2013. I’m not sure there’s one theory that explains this phenomenon at all: maybe it’s a combination of all six theories above, plus others that have escaped my notice. Or maybe I’m thinking too hard, and there isn’t an explanation. It’ll be amazing if you could do the same analysis for the other 3 members of the BIG 4. Thanks, Siddhant! Amy had the same thought – maybe a sequel for the future! – First of all, the last chart is probably pointing us to the right direction – I wouldn’t be surprised to find out that his low percentage today is a direct result of playing tiebreaks against the top4. 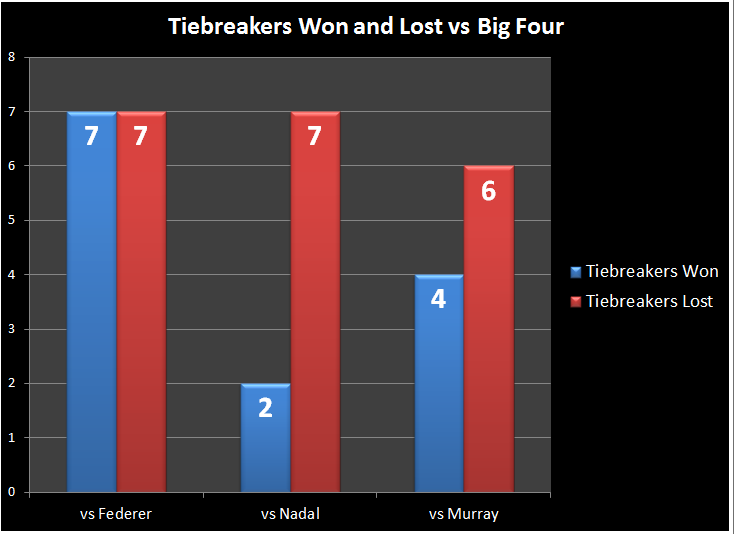 What I’d like to see is the numbers of tiebreaks won/lost vs top4/others – all in the same bar graph. 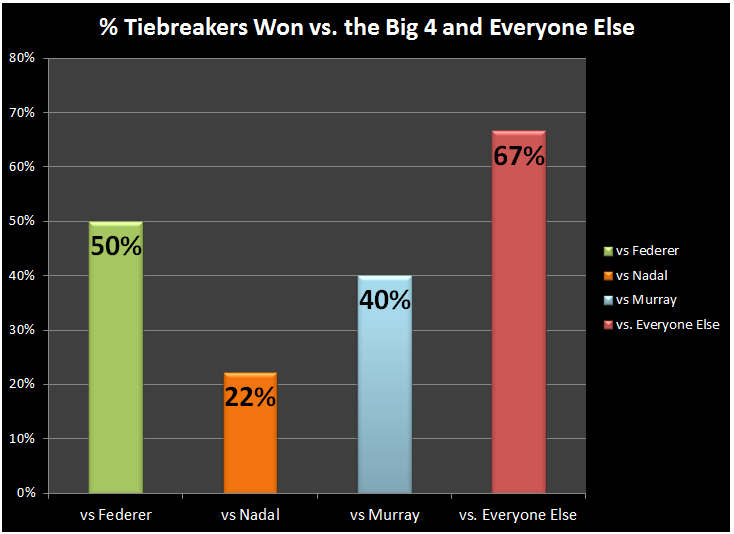 Or, perhaps more simply – which percentage of the tiebreaks he lost each year is vs the top 4 players? – 2011. It’s pretty obvious why he played fewer tiebreaks that year – he was busy collecting “6-0 6-1” matches, and rarely was taken as far as a tiebreak. Interestingly, most of those tiebreak sets (12 out of 19) were played in Slams: 3 at the AO, 2 at RG (both vs Federer), 2 at Wimby (both vs Tsonga), 5 at the USO. Glad you liked it, Anna. I have the data to answer your question, so I’ll create the table at some point and add it as a postscript. What I find interesting is that Djokovic’s mediocre record in tiebreakers against the Big 4 since 2008 doesn’t correlate to his overall record against them during that time period. For example, he’s 12-11 against Federer, 12-13 against Nadal, and 8-7 against Murray since then. About 2011, that’s fascinating. It just shows you how crazy dominant that year was for him, particularly in the M1000. And, of course – very interesting analysis! Excellent post — as always. As a Novak fan, I watched many matches he played since 2006, and, although my opinion is probably of little, value, I will try to add some of my observations to complete those revealing and interesting stats and theories. Two TBs are illustrative of his game before 2009: the one in the last set against Tsonga in the AO final, and the another, in the final of the Queens, against Rafa. The first thing we should note is that Novak’s serve was very efficient then, especially his second serve (PHM said, after their match at RG, that his second ball went 190 kmh; he certainly overstated a bit, but in the last few months we have glimpses of the way he used to serve his second balls). It gave him some free points here and there. Then, he already returned exceptionally well when focused, and it allowed him to keep many balls in play. At the time, his Wilson allowed him already to play his usual left/right one/two game, but he could flatten his shots and accelerate suddenly. He didn’t have enough depth on his FH, but the ball flew fast, and he usually forced long BH to BH rallies. Guy Forget, commenting the match, said that in the TB: “Djokovic ne lache rien”. He just didn’t make mistakes, and could always rely on a good serve, certain that his second serve would be good enough. So when he faced Rafa at the Queens, I was certain he would win the TB. But, strangely, he lost it: Rafa played the same game, but he wasn’t only playing long and waiting for an error, he was the more aggressive player. Later, the situation change dramatically. First, he lost his serve, especially his second serve after switching the racquet. He couldn’t make the difference there. Then, his FH started sailing long, and he had to play it with much more top spin: he couldn’t hit through any more. So, he had to rely much more on his defense, his ability to rally close to the lines, and against players like Federer, Nadal, Murray, it wasn’t good enough, or some big servers, it wasn’t good enough. In 2011, the situation changed again, and the happy few that make it to the TB played or served all exceptionally well. This year, I think the situation will change again: watching the AO, I got the impression that Djokovic improved hugely his second serve (he improved his first serve too): the kick seems very effective. His stats on the second serve against Murray, Ferrer (who was very tired and probably slower than usual) and Berdych (who very decently return serves) are telling. He still has to find confidently his range with the new racquet on the FH, but I believe that he will play better than ever in a few months already. Mat4, no opinions are of little value! That Queens final haunted me for a long time. As you remember, Djokovic served for both sets, which he ended up losing: in the first set TB he had a set point on his own serve, and he served for the second set at 5-4. To me, Djokovic learned a valuable lesson from Nadal that day: never take a match between them as anything other than battle royale. Djokovic was very casual during that Queens run, and managed to play incredible tennis to reach the final (trashed Hewitt and Nalbandián along the way, if I remember correctly). But when the match was on the line, his lack of focus showed, and Nadal made him pay dearly. What’s worse, that match ended up having an effect on him, as he went on to lose early at Wimbledon, despite playing some great tennis beforehand. About Djokovic’s second serve, a problem that started in 2008 was a strange emphasis on getting huge 2nd serves up the T from the AD court. Djokovic was getting a lot more mph on his second delivery, but it didn’t seem like the opposition was having any problems reading the serve or returning it. I thought it was a weird choice for developing a weapon: to me a great 2nd serve is not so much about power, but about depth and placement. If you can reach the corners of the service box with your second serve, that’s a great asset to have. It is a bit out of the topic, but I think that the war of attrition that started in 2008 between Nadal and Djokovic has redefined modern tennis and hurt, almost destroyed, both players. In 2008 and 2009 it started in the clay season, on Rafa’s ground (or turf) — in Hamburg and Paris, and it translated then on grass; Novak won at Indian Wells and was hoping for a great season, but Rafa turned the tide in Hamburg, to play perhaps his best season after that. Djokovic seemed lost until the WTF, where he won with a bit of luck. In 2009, Djokovic managed to improve his game after a few months, but then, lost match after match, and it culminated in Madrid. That match killed both: Djokovic lost to Kohlschreiber and Rafa in the QF. We know the story in 2011. Djokovic lost his inner self-believe, switch his racquet to obtain more power and spin, “nadalized” a bit his game, changed his coach, and needed two, three years to clear his head and become what he is now. Nadal, on the wave of those victories, became no1 in 2008, but the physical, emotional and mental toll those matches had (with some other factors, of course), lead him to his only lose at RG in 2009, and to an injury that kept him out of the courts for months. In 2011, he was already a proven champion and showed great resilience to the Djokovic onslaught, but, after the finally managed to turn the tide, once again he injured himself, his knees gave up. Anyway, it probably means nothing, but, nevertheless, it could be an interesting point of view. I think it will be interesting to see what is written about the Nadal-Djokovic rivalry, since most of the media has focused on Nadal-Federer as the token rivalry in tennis. In general terms, I agree with you: Nadal and Djokovic have stage a true war of attrition since 2007 – on every surface, and at every stage imaginable. I think it has been Nadal who pushed Djokovic forward, but also inflicted the toughest losses in Djokovic’s career. It’s been a fascinating dynamic, surely enough. Sorry for the many mistakes. Really cool article! I think its a combination of all of those factors…But being a Serb myself, I know Djokovic shares a trait we have almost uniformly: the word is “inat” in Serbian, and its akin to the combination of “spite” and “defiance”. I’ve noticed Djoko has a tendency to unleash only when pressured, out of “spite”, a typically Serbian thing. Maybe as a younger player he feared losing the breaker so much he focused insanely, but know knows it will only get his “inat” working? Im also over thinking here…. That’s fascinating, MattV. I had no idea about this “inat” concept. The 2011 US Open final sure seems like a very “inat” moment, no? HA! Thanks for that link! It’s a truly fascinating concept, though. I think it explains a lot about Djokovic’s career. And I completely agree with you about the arrogance factor. You need to be a little alpha-ish to climb to the top. Otherwise, you’ll get happy to just hang around the edges. I’ve decided to look at Djokovic’s 5-5 sets in general. It turns out that the ratio of the sets Novak won 7-5 to those he lost 5-7 has been inversely proportional to his tiebreaker W/L ratio. As a result, Djokovic’s 5-5 sets won percentage had been very steady until 2012, when it suddenly dropped (remember his scorelines against Murray?). 59.3% in 2005, 71.1% in 2006 and then between 60.5% and 65.5% in 2007-2011. In 2012, it was just 54%, but I’m not sure we should read too much into that just yet. 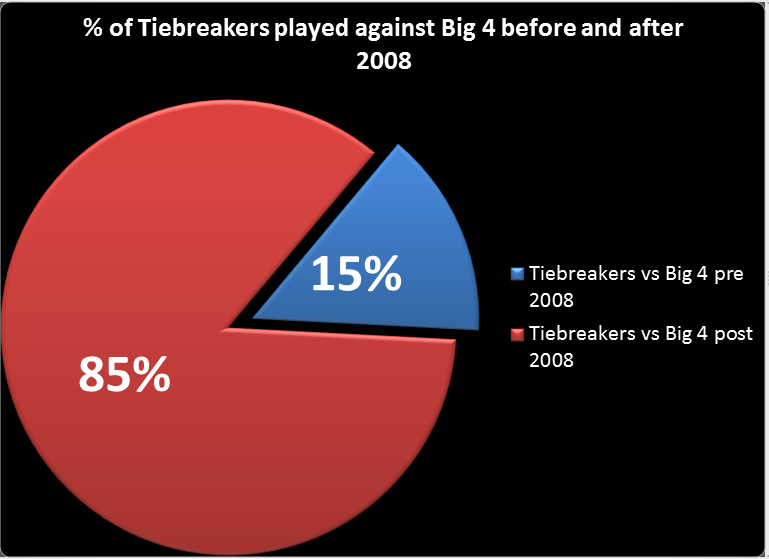 In 2008 (when his success rate in tiebreakers decreased), the number of 5-5 sets when Djokovic was able to avoid the tiebreaker increased by 9% and has stayed in the 40’s until today (with the exception of 2011, when he played very few 5-5 sets in the first place). While Djokovic has won 62.8% of all of his 5-5 sets, he’s managed to win 71.1% of the final sets that went to 5-5. Yes. The guy is clutch. 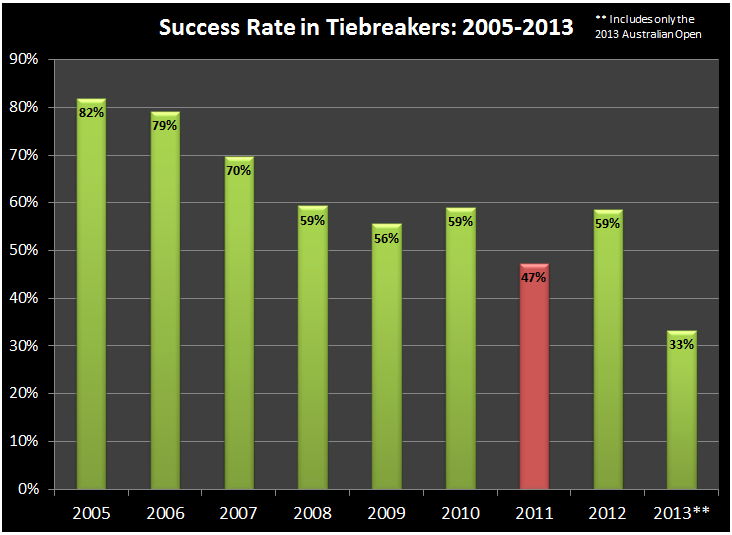 However, his final set tiebreaker record is consistent with his overall tiebreaker percentage. Interesting fact: In 2011, Djokovic had 29 5-5 sets and didn’t lose 5-7 even once. That’s just amazing, Michal. Thank you so much for that! I had no idea about the 7-5 sets, particularly his 2011 record, which is just astounding. Maybe the 7-5 phenomenon goes hand in hand with his rise as the best/one of the best returners in the world. In that 5-all game, or frequently at 6-5 (since Djokovic always chooses to serve first), it might just be that opponents just crack after facing so much pressure on serve throughout the set. I wonder if Djokovic himself expects people to crack in that game, and then takes it as a personal affront if his opponents hold serve and he’s forced into a tiebreaker. I really wish we could ask him these questions. Not that he’d answer them, but it’d be fun to just try. Thanks again for the contribution – it’s fantastic! There might be slight mistakes, and the ATP website seems to count the stats from Challengers as well, hence there are some discrepancies. U Da Best, Michal! Thanks a lot! Very interesting stats! I thought at first that it might just be due to natural variance, but then I took a look at the other Big 4 members’ yearly tiebreak records and noticed that Roger Federer won at least 70% of his tiebreaks in all the years he finished at No. 1 (and he got into a LOT more of them than Djokovic did! ), including an astonishing leap from 62% in 2003 to 81% in 2004, and that his TB rate was lower than 70% in all other non-No. 1 years. So why does Federer’s TB record so accurately reflect his degree of dominance while Djokovic’s TB record very much doesn’t? The most obvious answer is that Federer excels at serve more than return and hence that he’s more likely to get into tiebreaks and win them than Djokovic who gets into fewer tiebreaks due to being better at return but has a harder time winning them. But maybe confidence does play a factor in it: if Federer finds himself in a tiebreak, it probably indicates to him that he succeeded in not being broken at any point (as his best play often includes a lot of 1-minute love holds), whereas if Djokovic finds himself in a tiebreak, it might frustrate him more because he “should” have broken his opponent’s serve somewhere along the way. In any case, it really is fascinating that a player considered one of the most clutch players on tour has a so-so TB record. But then again, Djokovic’s clutch moments have typically involved winning sets by 7-5 and not forcing TBs (well, except for his 2011 Rome SF against Murray and 2012 French Open QF against Tsonga). Thanks for that, Ophelia! Yes, Federer’s record in tiebreakers is just nuts, particularly when he dominated the tour, as you mention. It’s just insane how he managed that 81% success rate in 2004. Then again, he was absolutely unstoppable that year. The hilarious thing about Djokovic’s career TB success rate is that it’s listed as the fourth best all-time. But what I find fascinating is that his career rate of 63% is one he’s never reached in a single year: as I mentioned above, he had those three years above 70%, and it’s been under 60% since then. But your point remains, these days, one of the most clutch players on tour (judging by his deciding set record and his big wins in tight matches) is merely a so-so tiebreak player. I think the part about “the Big 4 Problem” is getting to the point. Between 2006 and 2011, Djokovic went from being a very good player with good chances of beating almost anybody on tour to a fantastic player who was a heavy favorite against almost anybody on tour. As such, a lot of the players he was playing tiebreaks against in 2006, he’s now beating in sets with scores like 6-2 or 6-3. The best way to normalize would be to separately look at Djokovic’s tiebreak record against a) guys in the top 4, b) #5-#10, c) #11-#20, d) #21-#32, e) everybody else. My guess is that his winning percentage in each group has remained relatively constant, but the number of tiebreaks against players in groups A and B has increased much faster than the number against players in groups D and E. Assuming his winning percentage is lower the better the opponent, that would help account for the stats you’re showing. Thanks for that, dollymix. That seems like a good idea – maybe for the future! …Also, i think your wifes theory is spot on for the TB he just lost to Murray in the AO- you could see his frustration at all those missed break points spill into the TB and ruin it for him. HA! I’ll tell her that – and I agree with you. In that 1st set, it was Djokovic who had the chances to break, but didn’t, and played a very sloppy breaker. In the second set, it was Murray who had the chances early on, so maybe Djokovic played that tiebreaker with the peace of mind of knowing that he had dodged a bullet earlier. It’d be fun to see how Djokovic does in sets that ended in tiebreakers where he had BPs or even was up a break at some point. That just reminded me of his IW match with Isner in 2012 – I think he was serving for the 2nd set and got broken, then lost the TB and the match… In fact, I think he’s had quite a few “2nd set letdowns” in 2012 where the set ended with a TB despite him leading earlier. Interesting, wouldn’t surprise me if there’s a pattern there. Fantastic article. Great read, and nice work. Thanks a lot, Glen! I really appreciate it.